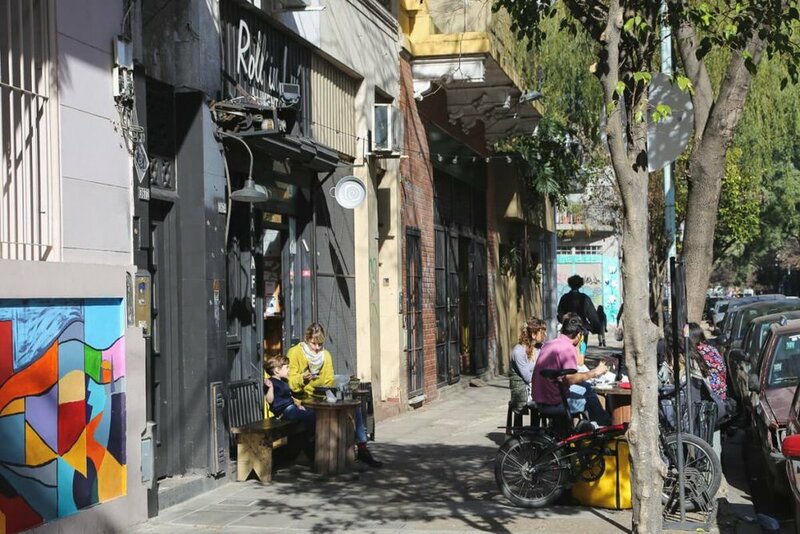 Chacarita isn't a neighborhood on most tourist's Buenos Aires itinerary. Where Recoleta is all society and mansions, Chacarita is a working-class neighborhood. This barrio is home to the city's largest cemetery, great pizzerias, and is up-and-coming with great new restaurants opening up in recent years. If you want to see another side of the city, like a local, visiting Chacarita is a great way to step off the beaten track. How much time to budget for a Chacarita tour? I'd allow half a day, ideally spending the morning touring the cemetery and exploring the surrounding streets. Follow it up with lunch at one of the classic local spots or newer restaurants nearby. 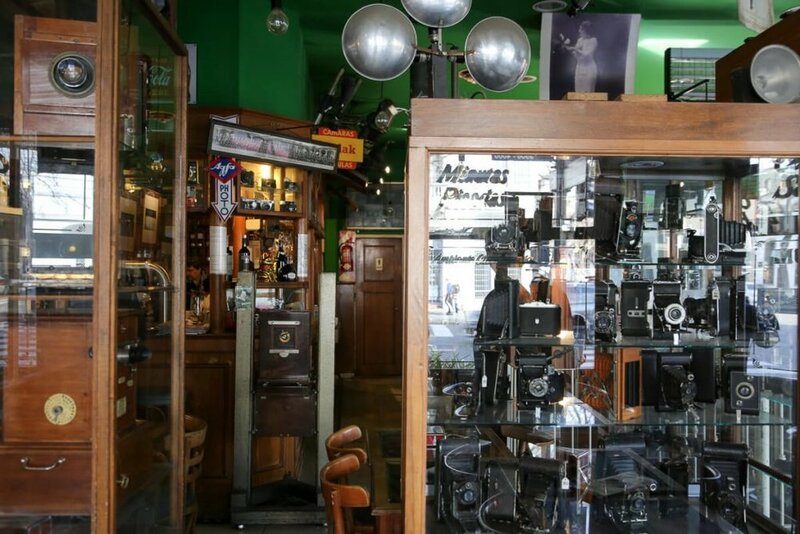 Top it off with coffee at a historic cafe that doubles as a photography museum. Afterward, you have the rest of your afternoon free. If you want to continue exploring the residential neighborhoods, Colegiales is a beautiful neighborhood just a few streets away. Prefer boutiques and wine bars? Take a taxi to Palermo Soho. While it's currently a transit center and the epitome of urban chaos today, nearly 200 years ago this area was the countryside that lied to the north of Buenos Aires. The name Chacarita comes from the word "chacra", which means a small vegetable garden. This area was home to a Jesuit school and its "small garden," or chacrita or chacarita. 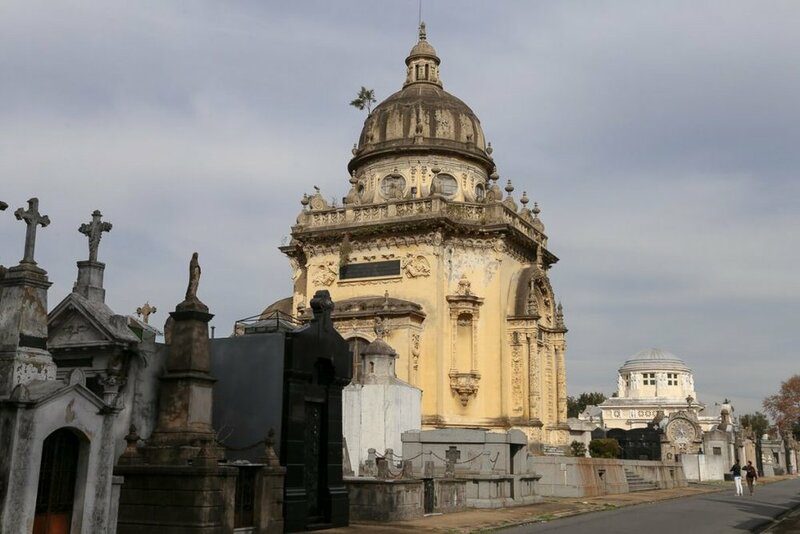 In 1871 things took a turn for the worse, there was a yellow fever outbreak that wreaked havoc in southern neighborhoods like La Boca.The city was forced to create a new cemetery in what is currently the Los Andes Park (a city park that's located outside the current walls of today's cemetery) for the yellow fever victims. (Unrelated side note, this makes me rethink that picnic I had once in that park...). There were so many victims to the outbreak, a tranvia (actually called the Funeral Tram or Tranvía Fúnebre) and a new train station with the same name, Funeral Station (that's dark). The cemetery wasn't exactly hygienic and had cremated up to 564 cadavers in one day. Imagine living next to that. Due to protests regarding hygiene from neighbors, the city shut down cemetery in 1875. 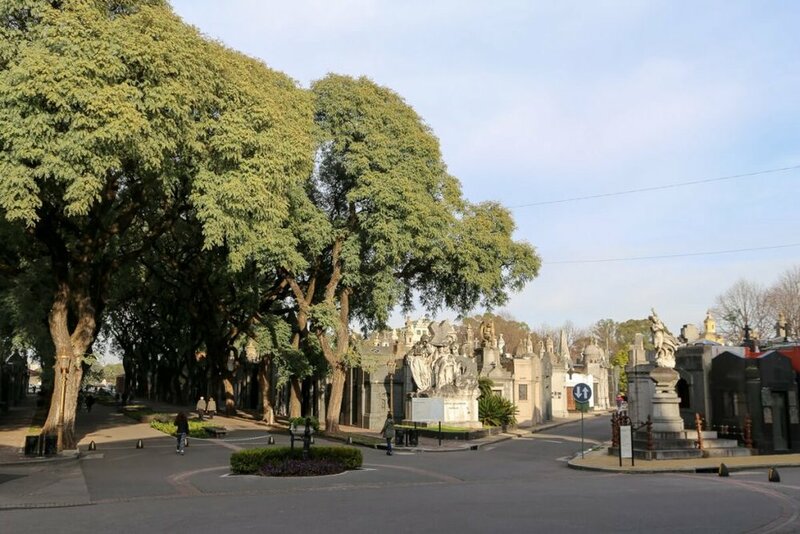 In 1887, construction began on the New Chacarita Cemetery, the cemetery you see today. It's massive, at 96 hectares (237 acres! ), it occupies a huge space in the center of a densely populated city. 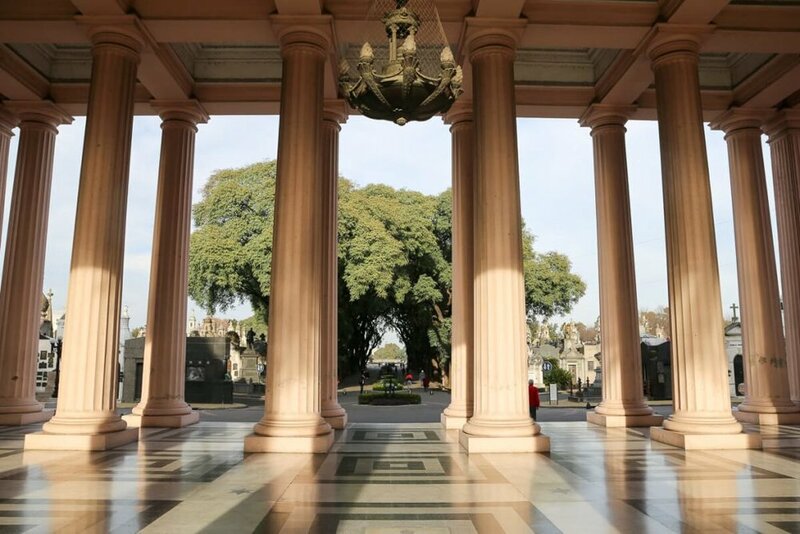 First, you'll see mausoleums and pantheons similar to (and much larger than) those in Recoleta. Next are crypts and niches. You'll see what looks like a park, but below houses niches in, if I'm honest, looks like the most organized and efficient burial system I have ever seen. Two stories underground, there are 9 of these underground niche crypt-like burials. Finally, are the graves or land burials. Citizens are interred here for 10 years. Then they'll then be removed and re-buried in a "niche" or crypt. While efficient, this all sounds so strange to me. It seems hardly like the "eternal resting place" I'm used to from the U.S. It's just proof of how attitudes on how we treat the dead are so different from culture to culture. 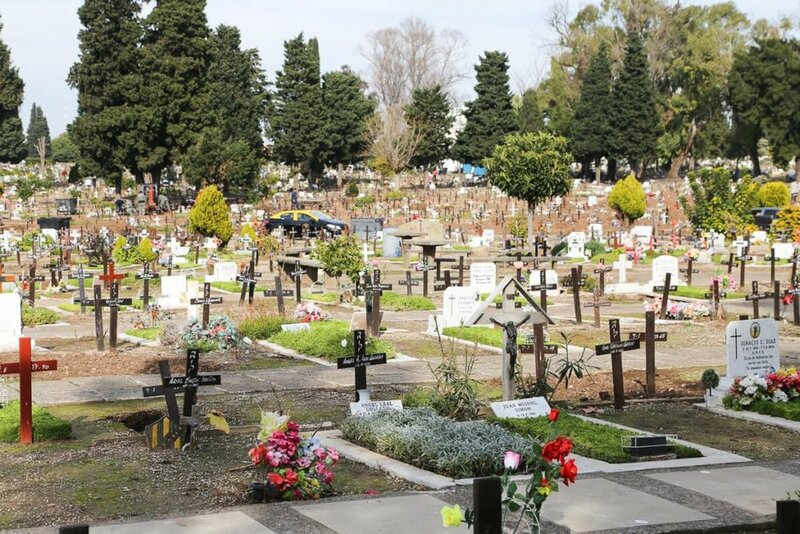 Recoleta may be where the city's politicians and military heroes are laid to rest, but Chacarita is where the people's celebrities are buried. There are pantheons that house hundreds and even thousands of coffins. Many of these pantheons belong to unions, and the most famous is the Artists' Pantheon. Musicians, actors, they were all buried here. You can find it at the end of the diagonal street that cuts through the mausoleums to your right when you first enter the cemetery. So many fans came to pay homage to their idols but weren't able to enter the pantheon. They resolved this by creating "Artist's Corner" (Rincon del Artista), located by the land plots (in the 7th sector). 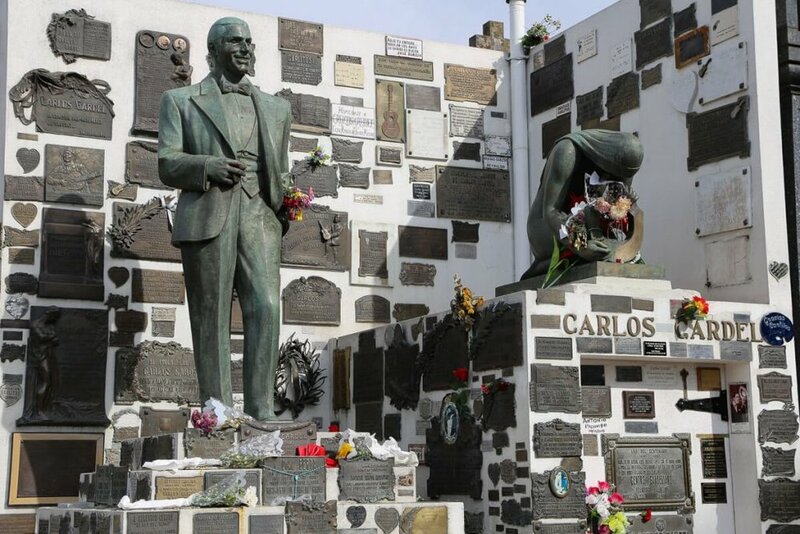 The city moved famous tango musicians, artists, and actors from their original resting place to be displayed here. I understand why they did this, these artists are iconic and people want to pay homage to their heroes. That said, it's a bit of a strange experience. Something about it all feels a bit, strange, I can't think of a better word. The country's most famous dead arranged in a circle, to be mourned in mass. 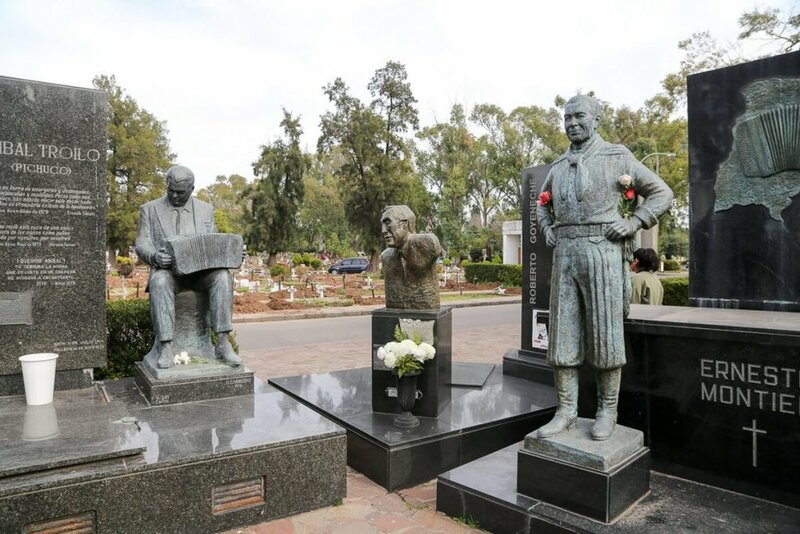 But, if you're looking to see the graves of Pugliese, Troilo, and Quinquela, they're conveniently located! 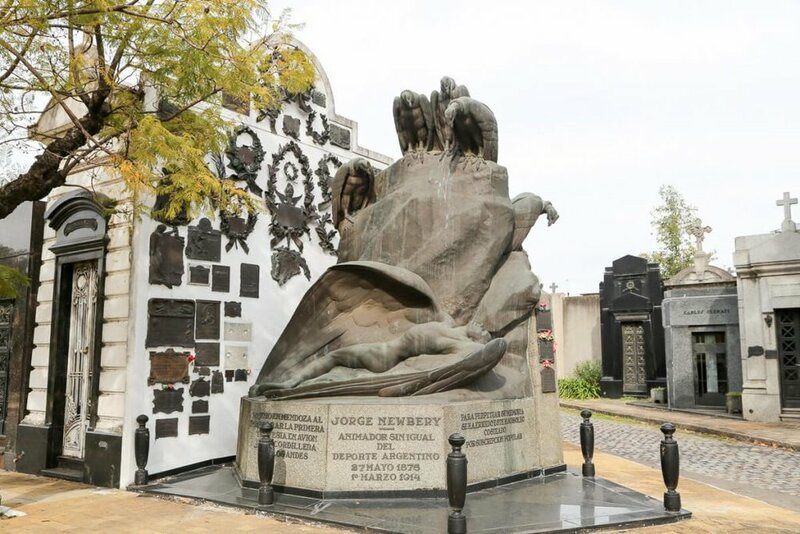 Standing apart, buried in a mausoleum of his own, is Argentina's most famous musician. Carlos Gardel is a tango legend, any tango song you hear in any movie worldwide is likely by Gardel (and it's probably Por una cabeza). He never married or had children, so Gardelianos, his fans, maintain his grave. Find his grave at the corner of streets 6 and 33. Gardel died young, in a plane accident in Colombia. The effort to bring his body back home was no small undertaking. The only way to bring a cadaver at that time was by boat. He was sent first to New York where he was transferred to a boat that brought him home to his Buenos Aires querido. The entire process took a year! When he was finally laid to rest in Chacarita, the funeral procession through the city was massive. Crowds filled Corrientes Avenue and the cemetery (many even climbing on top of the roofs of the mausoleums). Jorge Newberry, you may recognize his name from the domestic airport in Palermo. Newberry was an engineer and aviator. He was the first to fly across the River Plate in 1912. He died suddenly in 1914 in Mendoza preparing for his first attempt to cross the Andes. A woman asked him to fly, so he borrowed a plane from a friend (who warned him of problems with the wing). After some aerobatics, the plane violently crashed. At his grave is a monument. It's Icarus, who flew too close to the sun, with Newberry's face. He is lying at the foot of a boulder, which represents the Andes. The city government offers free tours of the cemetery on the 2nd and 4th Saturdays of each month, at 10 am. You need to understand Spanish. It says it's one hour, however, ours lasted two and a half hours (it's HUGE!). If the timing doesn't work out or you can't speak Spanish, you can still explore the cemetery. It's free and worth the visit. 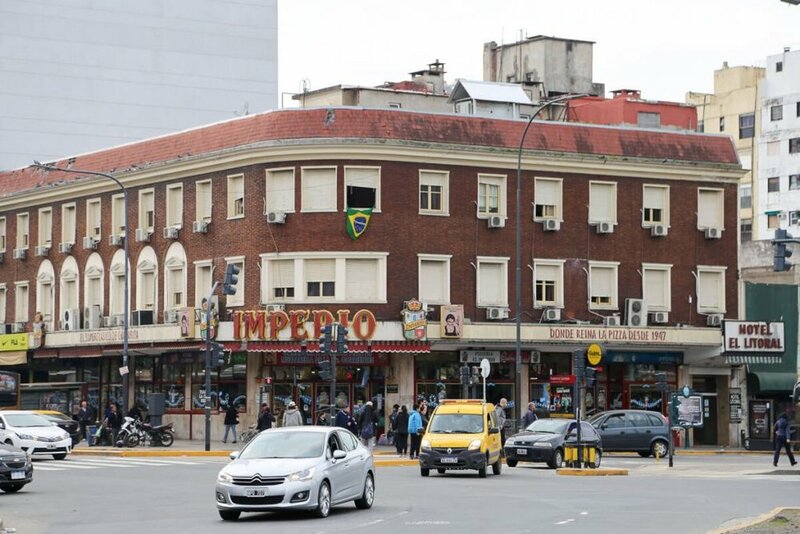 If you like a good greasy spoon diner, you'll love the two classic pizzerias in Chacarita. Imperio is directly across the street from the cemetery. 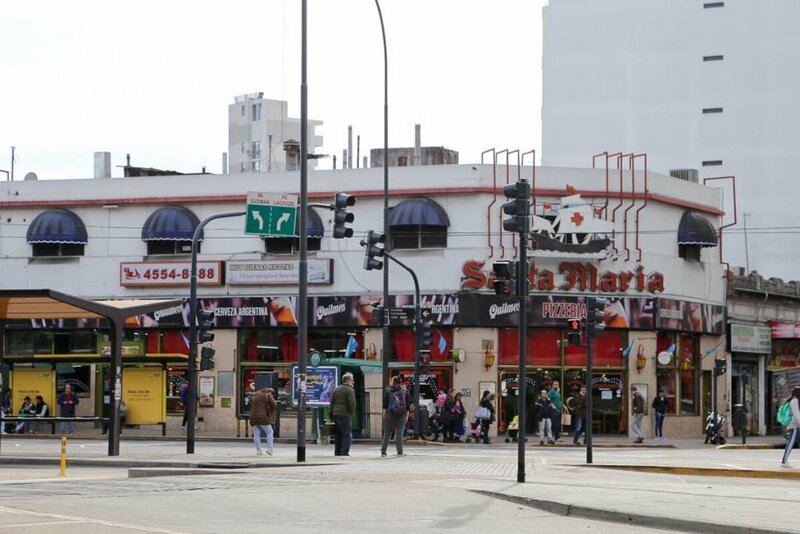 The Santa Maria is two blocks away on Avenida Corrientes. Lord knows I love Argentine pizza, but today I was craving something a bit lighter. Roll'in Luí Alimentos: The best salads and wraps in town, Roll'in Lui is vegetarian but you won't miss meat one bit. I always get a salad with everything and extra falafel on top. They have wraps with flavors ranging from Indian curry to Eastern Asian. I always go here if I'm in Chacarita. Always. Elote Cocina: Elote holds a close second place in my heart on the new Chacarita restaurant scene. They offer Mexican and Venezuelan fare: with tacos, tostones, and arepas on the menu. If you live in Buenos Aires or want to stock your Airbnb's kitchen, El Galpon is an organic market behind the train station on Lacroze Avenue. There's a restaurant selling vegetarian casseroles and a swing set in the grass nearby if you're with your family. There are essential oils, legit natural yogurt sold by the liter, organic vegetables and fruit, spices and herbs, and more. 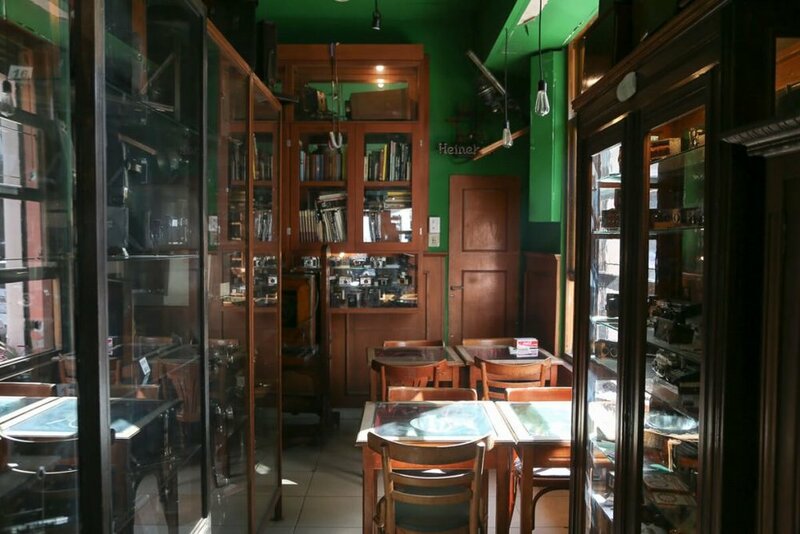 I hope you enjoy exploring a bit of Buenos Aires that is off the beaten track. Here is a map of all the highlights mentioned in this article to help you find your way.